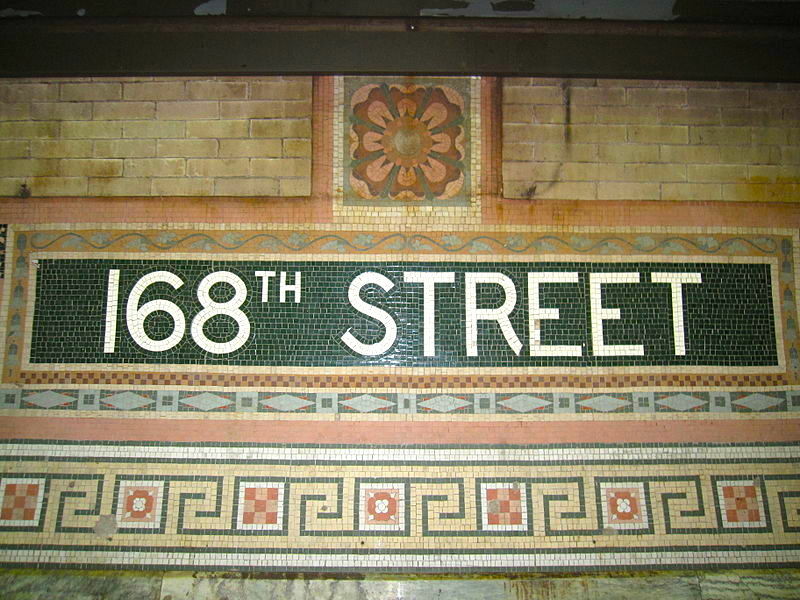 The subway stations along the original IRT line in Manhattan have some lovely decorative touches, like floral motifs and ceramic tablets indicating the station name. But I think the most beautiful subway ornament I’ve ever seen can be found at the 168th Street station, 100 feet under Washington Heights. 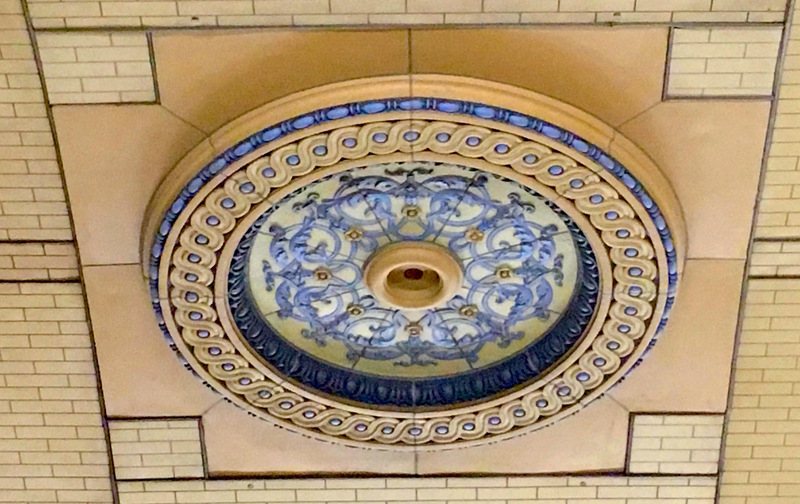 Affixed to the barrel-vaulted ceiling are large blue and tan terra cotta discs like this one, rich in color and design elements I’ve never seen in a train station before. All that’s missing are the chandeliers that likely hung from them in 1906, the year the station opened. The light fixtures aren’t the only bits of enchantment here. 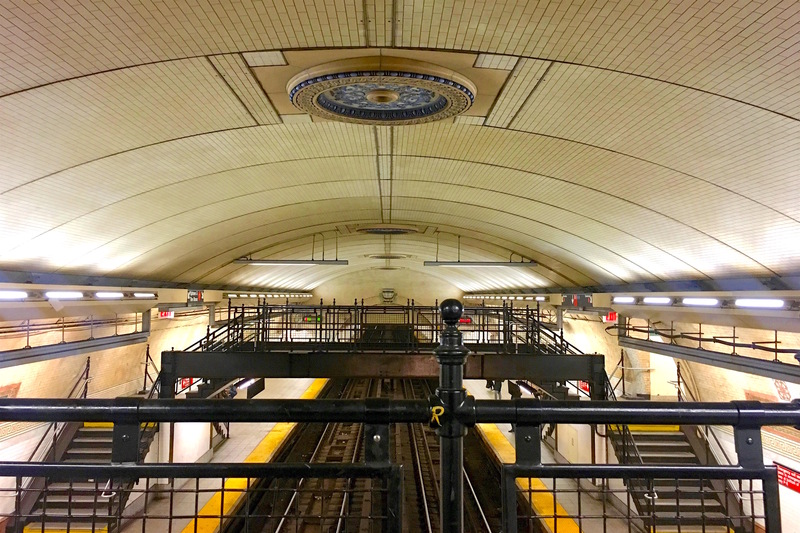 The recently cleaned vaulted ceiling (above), the walkways high above the tracks, and the terra cotta rosettes (above left) on the walls make it easy to imagine you’re in an Art Nouveau–inspired train station in Europe. This entry was posted on December 4, 2017 at 7:08 am and is filed under Music, art, theater, Transit, Upper Manhattan. You can follow any responses to this entry through the RSS 2.0 feed. You can leave a response, or trackback from your own site. I am untutored regarding EUROPEAN underground train stations however I’ve seen photos of RUSSIAN stations. These multiple, grand locations rival ballrooms in large event venues or even palaces! They are so outstanding no one would dare think of dropping candy wrappers or spraypainting vulgar words or gang signs. They have ornate light fixtures, intricate wall designs, and even the flooring is handsome. Each major stop reflects a design complimenting the uniqueness of the area. The rest of Russia may be drab and sad looking, but many of the underground stations almost invite ballgown and tuxedo clad travelers! Please, someone, find what the originals looked like and replace them. Perhaps a Go-Fund-Me page should be created. This glorious, newly-cleaned space deserves to be completed. Come forward, you benefactors originally from this area of the city. Here is a simple, one-off project that will last for generations and enhance your neighborhood. The chandelier may have looked like the ones in the City Hall Station, which was built 2 years prior. I’ve always loved this station, went through it often and looked at what was left of those chandeliers when I lived in New York City and imagined what it was like ‘back in the day’. You’d think the MTA would spring for a decent light fixture to put in that space. Doesn’t have to be a fancy chandelier, but a simple, early 20th Century style fixture would be sooooo nice in that ceiling. I have a new appreciation for Washington Heights. Great Picture. Hoping the residents will have pride in this and keep it nice! Washington Heights is my favorite tourist-free neighborhood—you must see it next time you are in NYC! My grandparents lived in that neighborhood,so I spent most of my life riding the No. 1 train to 181st Street to visit them. Those two stops: 168th and 181st, were my favorite stations when I was a kid, for that amazing design. That’s the IRT “Hoosick Tunnel,” a bore route that punched through the Manhattan Schist of Washington Heights to emerge at Dyckman Street, the deepest portion of the entire system. If you get out at 191st Street, you can take an elevator to St. Nicholas Avenue and 191st street or walk DOWN a ramped tunnel to Broadway and 193rd Street, which is actually a city street. That ramp has some wonderful locally-produced murals. 168th was my home station 191St was my stop for high school. 50s-60s. I also enjoyed the stations, the vaulted ceilings and the the pedestrian bridge across the tracks. very unique in the city subway. The photo is the first time I’ve seen the ceiling without years of grime. Washington Heights has a wealth of places of interest. You must have gone to Yeshiva…181st Street also had a bridge over the tracks. Great place to shoot photos of trains and the subway. 168th Street got better restoration than 181st. My grandparents lived in the Heights, so I was up there a lot, and we’d walk around. I was fascinated by the hills and stair streets, and that dead-end alley “Washington Terrace” off 186th Street between Amsterdam and Audubon. I believe it was workers’ housing for a local brewery originally, and was utterly rundown by the 1960s when I was there. I hope it’s been restored. David — Elaborate on the LOCALLY-PRODUCED MURALS. Describe them for us. Ephemeral can’t be everywhere (like GOD and Santa, esp. at this time of year!) soooo, you tell us what they look like. I find this deep tunnel transportation fascinating. The Metro in Washington, D.C. — is so deep into the earth at one of its stops, you have to travel on an escalator to get waaaay down to the tracks. It’s like entering a mine. Since it is located inthe nation’s Capitol city, it always reminds me of that great New Yorker Mag. cartoon showing miners looking up from their car, spotting Eleanor Roosevelt checking on them and their conditions! Andrew, sorry about the delay in answering. The local community did an art project involving top artists to create murals in that tunnel. There’s an entry about them on “Forgotten New York.” They are abstracts about the Latino community in that neighborhood. Is this the West Side – Broadway line or the East Side – Lex line station? I have never seen a photo of the chandeliers, does anyone know of one?